Is Chuck Marshalls Online Payday System Legit Or A Scam? In this article I review whether the Online Payday System is legit or another online scam. When I review most legitmate businesses I find that it is pretty easy to understand the business model at the core of the website, however this one was all over the place. It was difficult to make head or tail of the business model, which I’m sure you’ll understand what I mean in a sec. The good news is that I did get to the bottom of it, but not without a little research. What Is Online Payday System? It’s basically a referral system setup to generate leads for a number of online businesses. 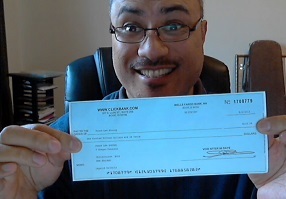 You join for free, sign up for a bunch of free trial CPA offers and then you get paid. I mean what’s not to like about that. Nothing really, but let’s talk a little about FREE trial offers, since that’s where you’ll be making your money. Yes, they are free most of the time apart from a minimal cost for postage and packaging in some instances. However, the point of a free trial is to get you using the product and then charge you for it after a certain amount of time has elapsed (7 days for example) where they will then charge you either a one off payment or a monthly fee until you call them to cancel. This is where things can get a little tricky (you got it – the cancellation part), this has never happened to me, because I have always steered clear of these types of businesses, but others have not been so fortunate. What Confused Me About Online Payday System? Okay, so the thing that confused me was if you type Online Payday System into Google, you won’t actually get the main website show up in the first page results (for some odd reason) you actually get blogs showing up. And the first blog I came across promoted Online Payday System with information related to signing up with ZipNadaZilch, which is the company that provides incentivized CPA offers. This wasn’t the confusing part … where I started to get confused was when I clicked on another website that took me to the same supposed system, but that system was actually promoting Express My Cash Freebies and Double My Cash Freebies which are also CPA companies. Okay, so I was like – wait whaaat? Same company promoting two different CPA companies. Turns out, Online Payday System version 1 used to promote ZipNadaZilch, but now they have moved to Express My Cash Freebies, Double My Cash Freebies, which is where Online Payday System 2 comes into play. Yes, it is free to join Online Payday System 2 as well as free to join the CPA companies they use with their system. There are two ways to make money. 1) Completing CPA offers in both Express My Cash Freebies and Double My Cash Freebies. This part is compulsory, as you can’t go onto to refer others without being affiliated with the CPA companies. 2) By referring others and getting them to do the same. (This is where you will make the most money). If you’re not successful at this, then your income will be limited, which will be a problem for most people who are new to online marketing. Is It A Feeder System To Empower Network? Some folks who have had experience with an MLM company called Empower Network have asked whether this system is a feeder into Empower Network. And just like Jeff Buchnans Instant Payday Network, which is an exact replica of this system btw, it certainly is. So Is Online Payday System A Scam Or Is It Legit? From the research that I carried out on OPS it doesn’t appear to be a scam, and certainly not from an incentivized offer perspective, but completing incentivized CPA offers for the sole purpose of making money is asking for problems. Could this be a reason why they’re not promoting ZipNadaZilch anymore? I dunno. But to be honest, I’m always relunctant to give my recommendations to a program where your income is soley based on incentivized CPA offers. But I believe it could work, so long as you keep in mind that you should cancel your free trial before the trial period is over, otherwise you could be in for a suprize charge. And remember, you won’t actually make much money if you don’t know how to refer people – so that’s the bottomline. Want learn how I make money online. Join me here. My Partner With Paul Review – Is It A Scam Or legit? It’s not what you think.